This is a brand guidelines book for E-motion is a modern eco-friendly electric car rental company. E-motion understands the absolute importance of reducing dependency on fossil fuels. This progressive company is taking action by providing alternative fuels for transportation. E-motion has the largest fleet of EV cars in the USA. They allow car renters the opportunity to get behind the wheel of an electric car and overall contribute to moving society into a more sustainable direction. The E-motion word mark is drawn from a geometric sans-serif typeface with a clean, modern look. It can be broken down into two parts the partial name and the extended full name. The characters have been carefully spaced for optimum legibility in a variety of sizes. The Thunderbolt is the main component and major focus of the logo. The thunderbolt is a symbolic representation of power and electricity. The Thunderbolt is element that appropriately represents the electric car. It is also the symbol for the ancient Greek god Zeus. Expressed in Heraclitus’ fragment, “the Thunderbolt that steers the course of all things”. The thunderbolt is cohesive representation of E Motion. As leading force in car rentals, E Motion is prepared to steer rents to make wiser choice as traditional forms of transportation become more problematic. The primary palette is comprised of the colors that are used as backgrounds throughout all E-motion communications. The use of black,white and radiant yellow ensures a sophisticated color execution. Sprout green and serene yellow are designed to work in harmony with the primary palette. They are used to make emphasis and as a mechanism to add depth or to fully explain an idea. Always use the exact color values listed in these guidelines. Slight variances in color may occur when the colors are printed through different processes or reproduced in different media. Yellow is the color of new ideas and logic. It helps others discover alternate ways of doing things. Yellow will resonate and attract like minded reformists. Green is the color of growth, and also prosperity.It promotes nature. Green reflects the E Motions progressive thinking and concern for the environment. Blue creating a sense of calmness, safety. It is also a reliable and responsible color. Blue emulates the companies preparedness to combat the challenges from fossil fuels. Peak petroleum will lead to an increased demand for petroleum causing prices for petroleum based goods and services to go up. The world has a limited supply of petroleum and current estimates predict that within the next 39 years mankind will have completely depleted this resource, affecting society from every angle. 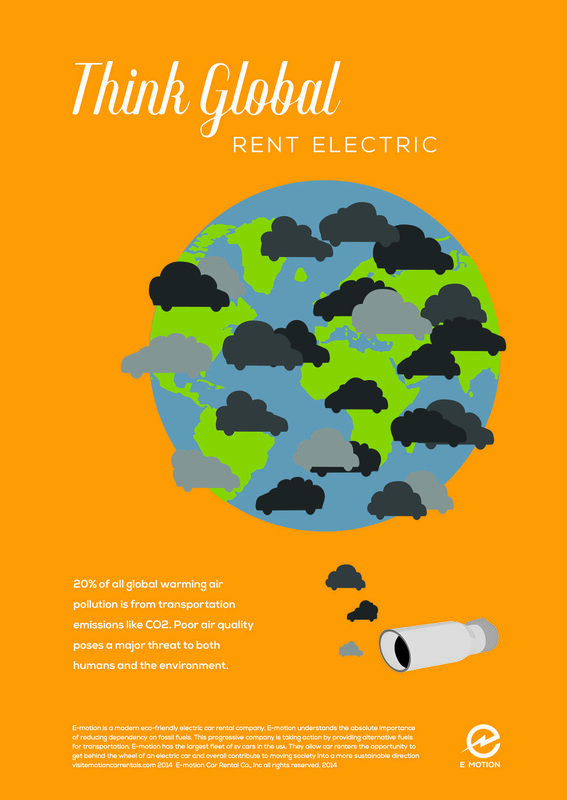 Car emissions are a major contributor to global warming and climate change. Climate change is caused by the excessive build-up of heat trapping greenhouse gases in the earth’s atmosphere, It poses a major threat both to the environment and to global development. Climate change threatens virtually every segment of the earth’s biosphere which of course includes human society. Polar ice and mountain glaciers are already melting, leading to rising sea levels. Climate fluctuations are causing severe droughts, floods, and storms around the world. Air quality is reduced and affects the overall health of all living things. Petroleum is a major part of the chemical makeup of many plastics and synthetics. Healthcare has built its foundation on tons of petroleum products. These products include: plastic disposables like synthetic surgical gloves, medicines such as aspirins and topicals like Vaseline. Oil spillage is a very common problem also effecting the soil environment which has a negative impact on the biological environment. Currently, about 80% of lands are contaminated/polluted by products of petroleum origin. They soil contamination directly effecting, ground water and vegetation growth. There is a long list of toxic materials in petroleum products, many of which can be deadly. These toxins are known to cause cancer and severe health problems.